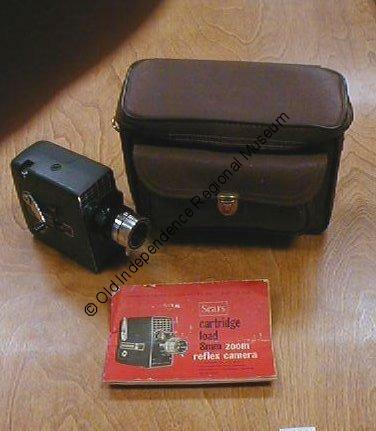 This Sears 8 mm Cartridge Camera 3_9130 has a reflex-zoom. It was sold in 1964 for $199. It is black with a chrome handle for winding the film. The eye cup is made of rubber. The camera was made in Japan. The 12 page instruction booklet and “kam-ra” bag was donated with the camera but we do not believe the bag was original to this camera. This book is part of the Howard Collection at Old Independence Regional Museum.